New book brings a historic industry to life | The Dacorum Heritage Trust Ltd. The iron foundry which existed in the Marlowes, Hemel Hempstead, for over one hundred years is now just a dim memory. It once occupied a large rectangular plot from the Marlowes down to the river Gade, roughly where Bank Court stands today. The adjacent Works House (believed to be a former farmhouse) was home to the Davis family and later to Ben Bailey, the last owner before it was demolished when the New Town was created. It was called ‘Boxmoor Ironworks’ because that part of Marlowes was in Boxmoor Parish and later had a Boxmoor telephone number. 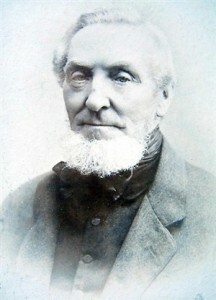 James Davis was born in Reading in 1813, the eldest son of a farmer. James, together with two of his brothers, became an iron founder. He moved from King’s Ash Farm at The Lee, Buckinghamshire, and set up his own foundry in Hemel Hempstead in 1841. He lived at first in Bury Mill End, where he met and then married Matilda Taplin. The iron foundry was located in Lower Marlowes and the growing Davis family lived next to the works. 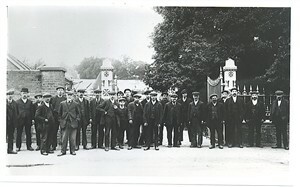 In 1861 the foundry employed 20 boys and 48 skilled men – a sizeable workforce for the time. There were moulders, engineers, blacksmiths, pattern makers, carpenters and painters. Many local names were recalled by Ivor Barnes and Harold Woolveridge; (both of whom were employed there in the 1940s), such as Dollimore, Howe, Picton, Potten, Puddephat and Sells. The firm made high quality agricultural machines and implements. They had a repair service ‘second to none’. All nuts and bolts were made by hand and heavy weights were moved by hard labour together with levers or rollers. There was a smelting furnace and an 8hp steam beam engine by John and Edward Hall of Dartford, dating from the 1840s. The A12 Plough and the Coronation Rick Elevator were two of their products and the replacing of plough shares gave a steady trade. Markets within a 25-mile radius were regularly attended, as well as farms throughout the home counties. James and Matilda Davis had one son, William Nash Davis, who unfortunately died when young. Their daughter, also named Matilda, married James Lane, a farmer from Luton. On William’s death in 1871, James Lane became involved in the firm and the name was changed from Davis & Son to Davis & Lane. However, the Lane family departed for a new life abroad in 1891, so the next family to become involved were the Baileys of Chambersbury. James Davis’s youngest daughter Emma married Joseph Bailey, a 37 year-old local farmer, in 1872. Sadly, Joseph became blind after an operation and could not handle the day-to day practical side of affairs. They had five sons and a daughter and two of the sons were chosen to manage the ironworks belonging to their mother. Joseph Bailey (junior) and his younger brother, Benjamin, are probably still remembered by some local inhabitants. Joe died in 1949, leaving his share of the business to Ben, as well as the nearby Aeroplane Meadow. Joe was a remarkable man, as well as running the Company, he made himself responsible for maintaining the whole Bailey family. 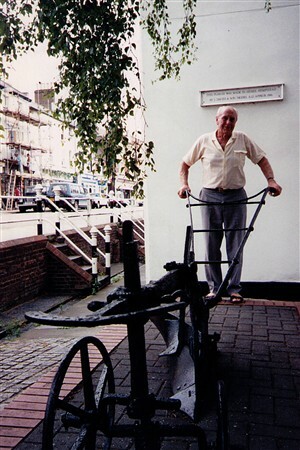 The site was sold soon after Joe’s death, the buildings demolished and the only trace of the Boxmoor Ironworks visible today is the J Davis & Son plough in the High Street. The new book called ‘Men of Iron – The History of Boxmoor Ironworks and the Davis, Lane and Bailey Families’ by Roger and Joan Hands, is now published and is available from Dacorum Heritage Trust, price £10.00. (It is also available from David Doyle’s Estate Agents in St John’s Road, Boxmoor).